December 2, 1980. 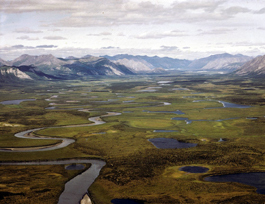 The segment within the Arctic National Wildlife Refuge. Originating from extensive glaciers in the Romanzof Mountains, this river travels south 200 miles to join the Porcupine River near its junction with the mighty Yukon. The river flows through a wide variety of arctic habitats and scenery. Portions of the Porcupine Caribou Herd occasionally winter in the Sheenjek Valley.